Capable of satisfying any gastronomic demand. 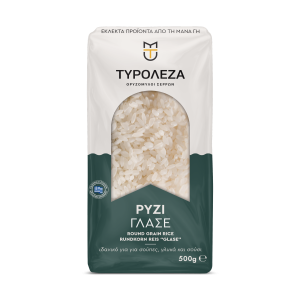 From daily simple recipes to the most special dishes, Tyroleza rice is a choice of high quality. From Carolina and Glasse to wild rice with Bonet, your preferences will be fully satisfied. Ρύζι Καρολίνα Ideal for risotto and traditional Greek recipe, stuffed vegetables with rice. Yet one more gift from the Greek soil. Tyroleza brings the unique Carolina rice from their producers to your meal. This variety is distinctive and carries the peculiarities of the soil and the climate that grows with it. Widely known as parboiled rice, it has a distinct, unmatched look and texture. It comes from carefully selected Greek producers with the guarantee of Tyroleza. Easy to cook and fit in many recipes. Another exceptional offer, closely connected to the Greek agricultural culture and with a distinct white look. Glase rice is one of the oldest known variations and is part of many different cuisines around the world. Ideal for when you desire some thick texture to your dish. A rice variety you will find in many kitchens, is widely used because of its form. A product of Greek land and the hard work of producers who uphold the highest standards in quality. White and broad-leaved is a fitting choice for pilaf. A favourite choice in recipes based on the unaltered nutritional status of rice, as it contains multiple times the vitamins of other varieties. Try it in salads but also in pilaf. A unique combination of wild rice with bonnet, gives your recipes the special touch to turn them into an amazing gastronomy experience. Rich in fiber, with distinct sweet and smoked flavor. Blends in harmony with meat. Basmati rice, with its unique and distinct white color, is a basic pillar for so many favorite recipes. With natural aromatic properties that are loved in every corner of the world. Ideal for a Greeks’s favourite, pilaf as well as fusion recipes.